In the words of the International Monetary Fund, the Brazilian economy is “underperforming relative to its potential, public debt is high and increasing, and, more importantly, medium-term growth prospects remain uninspiring.” If the fund’s predictions are correct, Brazil’s GDP will grow by only 1.8 percent, after numerous revisions. In 2019, the next president will inherit a country with little investment capacity (only 0.5 percent of the GDP) and a brutal fiscal crisis. Yet, Brazil’s biggest banks seem to be cruising through the crisis. 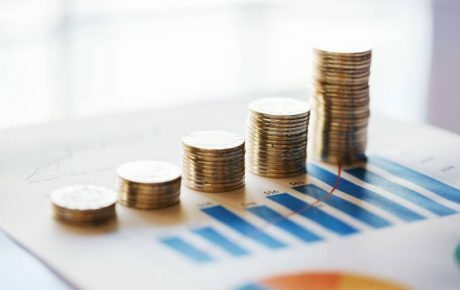 The country’s top four banks on the stock market – Itaú Unibanco, Banco do Brasil, Bradesco, and Santander – have recorded combined profits of BRL 16.9 billion, the best result since 2015’s second quarter. Even during the recession’s worst moments, these banks’ quarterly profits never came in south of BRL 11.6 billion. Whatever situation the Brazilian economy may face, one thing seems certain. Banks will be making obscene profits. While most European banks post a single-digit return on equity numbers, Itaú (Brazil’s biggest private bank) reported 20.1 percent. Actually, RoE never fell below 15.9 percent for Itaú and Bradesco. The story behind the outstanding profits of Brazil’s biggest banks cannot be told without two details: a vast number of fees (which rise above inflation every year), and market concentration – which allows a small number of players to control interest rates and reduce credit offer in Brazil. 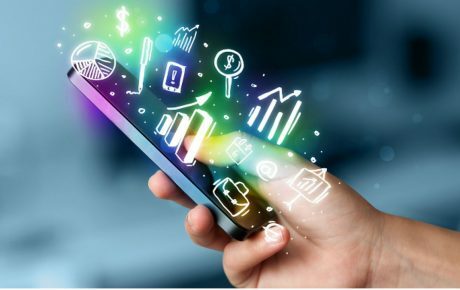 The positive results are also explained by cost-cutting actions (such as closing branches and relying more heavily on online banking) and stricter control of credit scores (which reduced default rates). Brazil’s Central Bank forces every institution to offer certain banking services free of charge. Among these are four withdrawals per month, two wire transfers to accounts of the same bank, two monthly bank statements (online consultations are free of charge), and 10 checks. Any other service that doesn’t fall within this basic pool will be charged – big time. For example, wire transfers between accounts of different banks can incur fees of almost BRL 20. In 2017, Brazilians paid BRL 27.3 billion in banking fees to the top 5 banks (including Caixa) alone. For some institutions, fees account for up to 25 percent of their revenue. Banco do Brasil was the bank that made the most money out of tariffs last year, BRL 6.9 billion – a 9-percent bump from the previous year, which helped boost the bank’s yearly profits by 54 percent. When asked about these tariffs, banks are often evasive. 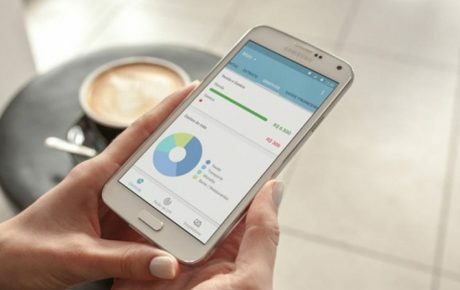 Santander recently published a statement saying that rises in fees “follow movements of the market and inflation.” However, a study by the Brazilian Consumer Institute (Idec) published at the end of last year showed that bank fees have risen way above the rate of inflation between November 2016 and October 2017. While the official price index was at 2.7 percent, services from the top 5 banks rose by up to 78.9 percent. Out of the 58 service packages offered by these banks, 50 had substantial price bumps. In June, Brazil’s Central Bank showed that the country’s banking system is among the world’s most concentrated. Caixa, Banco do Brasil, Itaú Unibanco, Bradesco, and Santander control 82 percent of the market in the country. In developed economies, only in the Netherlands is the banking system more concentrated – with 89 percent. 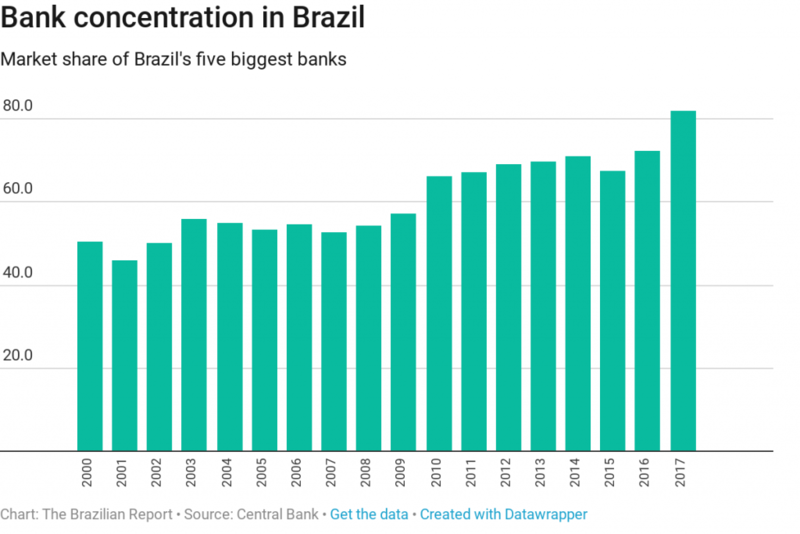 While bank concentration rose in most countries after the 2008-2009 global financial crisis, it exploded in Brazil. Twelve years ago, the top 5 players chewed a 60-percent market share. 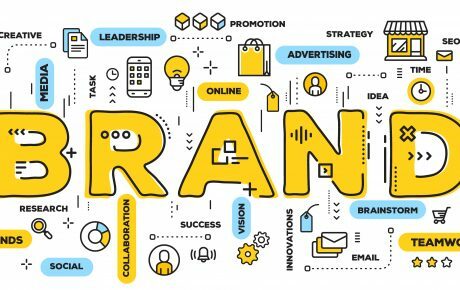 The market concentration got even worse over the past two years, as Itaú Unibanco took over Citigroup’s Brazilian operations, and Bradesco bought HSBC Brazil. Such a concentrated market helps to explain why Brazil still has one of the world’s highest real interest rates in the world. 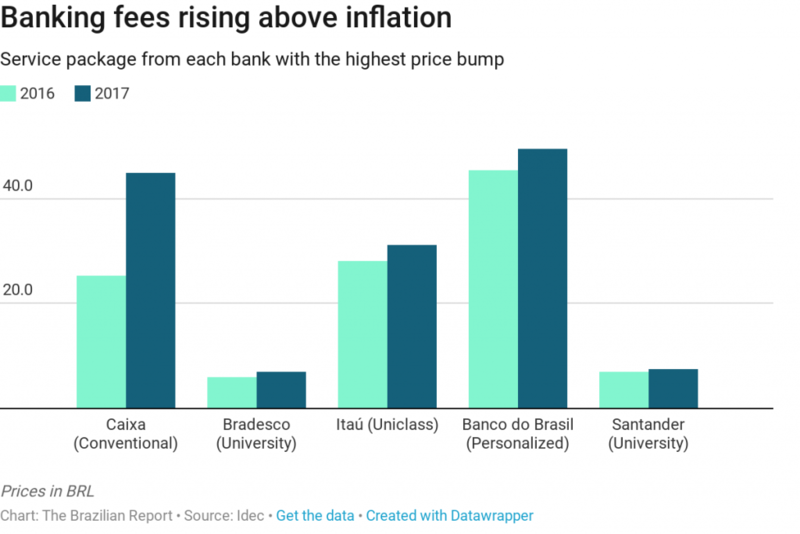 According to a study by MoneYou and Infinity Asset Management, Brazil’s real interest rates (after discounting inflation) are the fifth highest in the world. If there’s a silver lining to be found, it’s that Brazil used to top the list back in 2016. 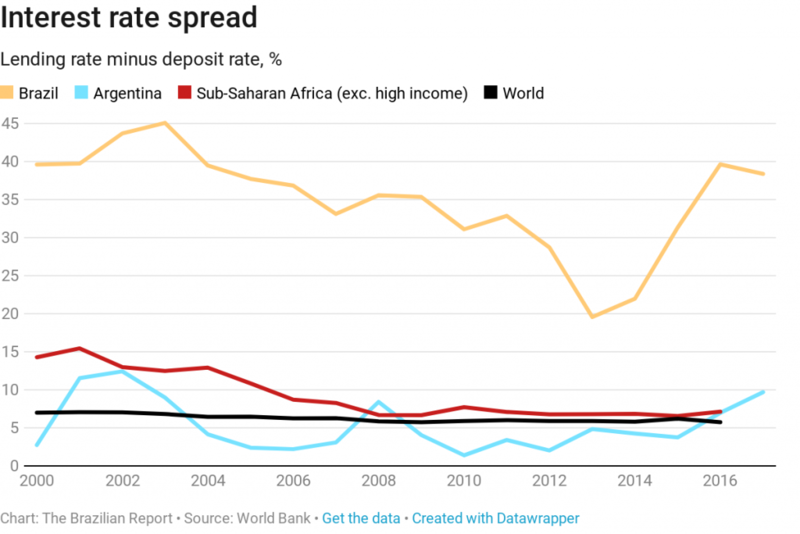 Brazil is also one of the world’s leaders in net interest rate spread – which is the difference between the average yield a financial institution receives from loans, along with other interest-accruing activities; and the average rate it pays on deposits and borrowings. According to data from the World Bank, Brazil’s interest spread stands at 39 percent – three times that of Peru and 10 times that of Mexico. Only Madagascar, with 45 percent, has a bigger spread. According to economist Bretty Grobman, Brazil’s high concentration plays a big part in that. “It obligates smaller banks to have huge interest rates in order to survive,” she told G1.